NEW HT-121 Human Touch Home Massage Chair / Recliner - Work. Traffic. Lifting that heavy box on the top shelf in the garage. The dog eating your tax refund. It’s impossible to control all of life’s stress, but you now have full control of a great way to alleviate it. The HT-121 WholeBody™ Massage Chair makes it easy to customize its every movement to satisfy your every whim. The WholeBody™ massage is designed to be both strong and sensitive to melt away muscle soreness providing a revitalizing, therapeutic massage with just the touch of a button. The HT-121 WholeBody™ Massage Chair is built utilizing the multi-patented Human Touch Technology, approved by the World Federation of Chiropractic. Choose from three intelligently designed 15-minute massage sessions, lie back on the ergonomic headrest and let the patented human touch massage system™ rotating foot and calf massager kick all that tension and stress to the curb. WholeBody™ Massage Chairs contain all the advantages of Human Touch’s Robotic Massage®, plus a suite of additional features designed to deliver a therapeutic massage. Incorporating patented Figure-Eight™ Technology, its proprietary mechanics uniquely drive its robotic rollers. 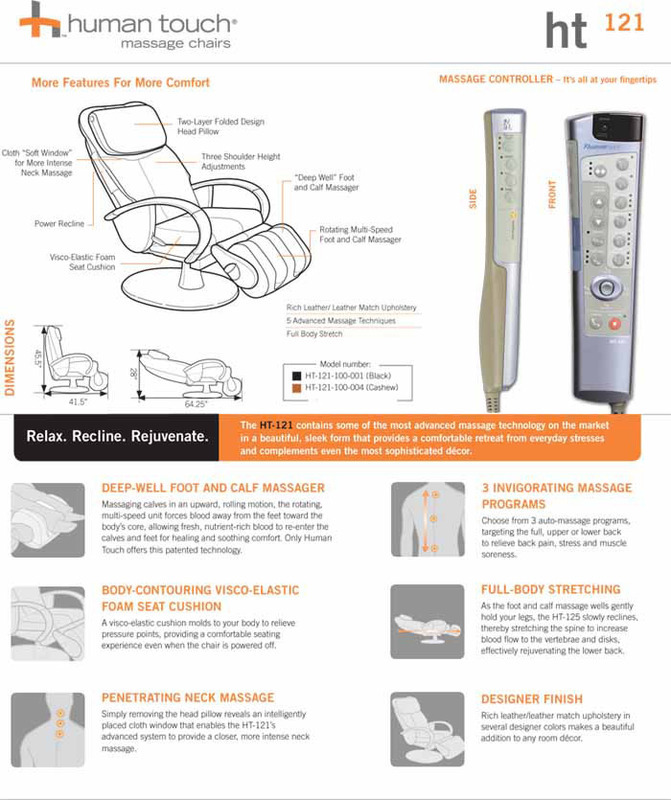 This massage chair delivers a remarkably life-like massage that emulates the expert hands and techniques of highly trained massage therapists. The HT-121 chair’s foot and calf massager shares this exclusive patented engineering, delivering a massage that introduces oxygen-rich blood to the legs, reviving tired muscles. So sit back and relax. With the beautifully designed HT-121 WholeBody™ Massage Chair, your comfort, stress and wellness are well under control. The HT 121 Massage chair offers a combination of our patented Human Touch Robotic Massage Technology™ with a comfortable design and a classy, elegant look, including two choices of durable yet comfortable faux-leather. Three Auto Programs feature a combination of massage techniques designed to meet specific needs. Adjustable Neck Pillow: Contoured-Comfort Neck Pillow. 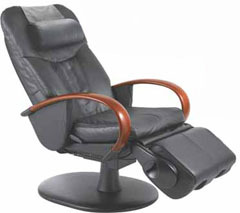 Adjustable Power Recline Backrest: With the push of button, you can adjust the angle of the backrest. Adjustable Footrest Height: Adjust the height of the footrest to ensure your complete comfort at all times. Extended 2 and 5 year Human Touch Factory Warranties are available on New Chairs. *WARRANTY INFORMATION: New HT-121 Signature massage chairs have a "3/2/1" Year Factory Limited Warranty. The HT-121 massage chairs come with a manufacturer's three-year limited warranty against Structural defects (Frame only - cosmetics are not covered). Parts are covered for two years from the original date of purchase. In Home Factory Service (All 50 US states and most major cities in Canada) is covered for one year from the date of purchase and can be extended with an extended warranty. Refurbished Massage Chairs have a 90 Day limited residential use warranty for parts only. The warranty is not valid if the product has been misused or damaged in any way that is beyond the control of the manufacturer. Chairs are packed for shipping and require only very minor assembly. (Basically just unpack and ready to use.) Extended warranties are available on New Massage Chairs Only.